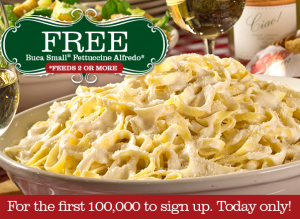 Free Fettuccine Alfredo @ Buca Di Beppo- Today Only!! The first 100,000 people to sign up HERE will be emailed a certificate for a FREE Buca Small Fettuccine Alfredo (feeds 2 or more!) from Buca Di Beppo! Offer valid today only, 2/2/14 while supplies last.